Under Jeremy Corbyn’s leadership the Labour Party has staged a stunning revival, prevented Theresa May achieving a landslide which she would have claimed as a mandate for ‘Hard Brexit’ and has caused a crisis of Tory government which will make it harder to make new cuts in public spending, apart from rising inflation. None of Corbyn’s opponents could have possibly achieved that outcome. This point can be factually established in two ways. First, there is the record of the election campaign itself. None of Jeremy Corbyn’s internal or external opponents would have conducted anything like the same campaign or written anything similar to the manifesto that was produced. On the contrary, the tactic of Corbyn’s opponents was to ‘give him enough rope to hang himself’,believing that his programme would prove massively unpopular. The Labour manifesto was leaked on May 11. It was probably not the intention of the leaker(s) but the effect was that Labour was able to have two launches and close examination of what proved to be a very popular manifesto. The polling effect was clear. 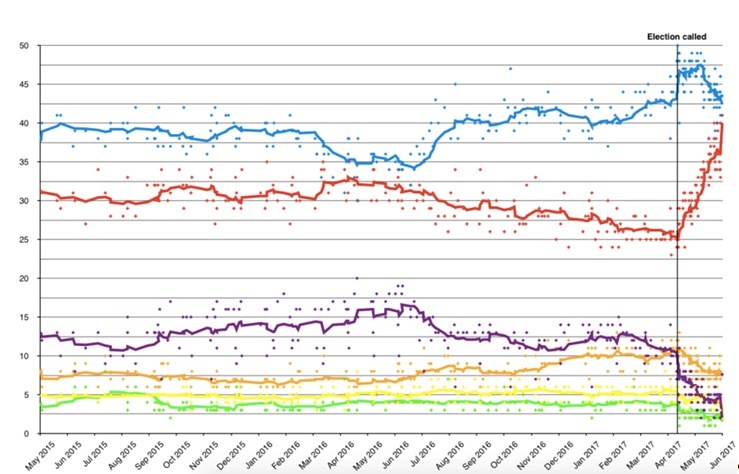 On May 11, Labour was 14 points behind the Tories at 32% to 46% in the average of polls. On June 8 that lead had been cut to 2 points. No doubt some of the narrowing was due to the Tories’ own manifesto, which in the words of one commentator ‘promised permanent winter but never Xmas’. But in the event the Tory support only fell by 4 points overall despite the dementia tax, axing free school meals, ending the ‘triple lock’ on pensions, no new money for the NHS and much else besides. Evidently, the main motor of the narrowing of the gap was Labour’s own platform aimed at defending living standards. 8 of the 12 point narrowing in the Tory lead was due to Labour’s campaign. Secondly, there is comparative data to draw on. The Dutch general election and French Presidential elections have already taken place this year. 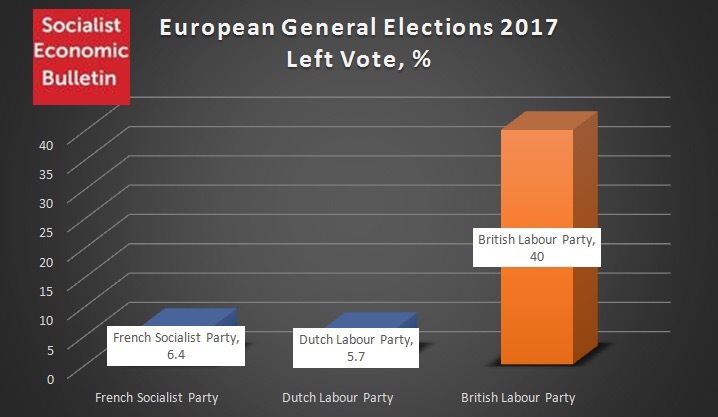 The Labour Party has sister parties in both countries, the Dutch Labour Party the PvdA and the French Socialists, Partie Socialiste. They both stood on platforms that were at odds with the Corbyn manifesto. In both cases they accept and even embrace austerity. They also have policies which are anti-immigrant and anti-Muslim. Corbyn’s Labour had none of these. The result is a full justification of the superiority Corbyn approach in electoral terms. For a number of years numerous commentators and academics have claimed that UKIP primarily took votes from the Tories, that Labour was therefore ‘unelectable’ and even that UKIP ‘posed an existential threat to Labour’. All this was done to support the reactionary claim that Labour could only advance by being anti-immigrant, as this reflected the views of its core supporters. As the election result shows, none of this was true. Labour primarily advanced because it promoted policies to defend living standards when they are falling once more and the Tories plan to deepen that. Labour eschewed all blame on migrants for the crisis, and the manifesto only had warm words for the contribution that migrants make to the economy and to society more widely. Partly as result, where 41% of voters cited immigration as a key issue in 2015 only 6% thought it was a key issue in 2017, according to Ashcroft’s exit polls. In 2015 Labour had a ‘zero-based spending review’ and pledge to cut net migration but in 2017 it had policies to defend the living standards of the overwhelming majority and only warm words about migration. Labour rose by almost 10% in 2017. As the economic crisis deepens and real wages continue to fall sharply the Tories will attempt to deflect the blame for their policies onto migrants once more. Labour is currently on course to win the next election because it has policies that defend the material interests of most people. Labour looks for solutions to the crisis from those who have caused and benefitted from it, big businesses who refuse to invest and the rich whose incomes have risen even in economic stagnation. In stark contrast to the Tories, Labour has not sought scapegoats. This is a winning formula. I have just shown my youngest daughter a video of a fox hunt and some pictures of foxes. She looks horrified as you can imagine. I then saw TM on the news and I said to my daughter, ‘that person on there wants to make this legal again as she has lots of friends who like doing this to those foxes’. My response, ‘no the police can’t do anything because there are no police left to take people away. She has taken money from them too’.